There was more that wasn’t published, so I’ve included the “unofficial” version after the jump. Special thanks to Design Bureau and Lauren Smith for including me in this interview. How do you think that differs from the pre-digital-music era, was there a lot more money to be made in album art design? Packaging used to be a key component to the delivery of music but in the digital age there is less of an emphasis on album art and packaging. This can make album art become an afterthought or be seen as unimportant. With digital-only releases and apps like Spotify, Rdio and iTunes, all you need is a lo-res jpg of an album cover, if anything at all; no packaging, no liner notes, etc. 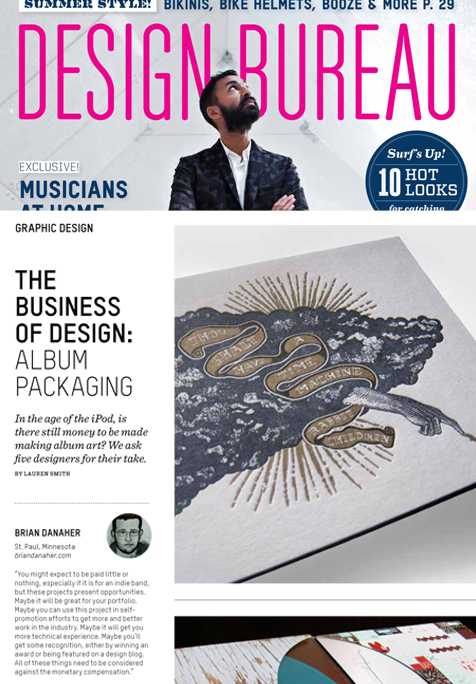 Also, anyone can get a copy of Photoshop and make their own “art”, so the emphasis on finding and paying skilled, competent designers and visual artists to create great album art is seen as a “nice-to-have”, but not an essential part of the final product since it cuts into budgets and is therefore expendable. There are most certainly artists and labels out there that take their album art seriously but even their resources are diminished compared to the pre-digital music era. I think there are two opportunities here. The first is to create short run, limited edition high-end music packaging. I still think those who care about music care about the entire package, including the album art. If you are going to have a physical release, create something great and give people a reason to buy it. This tactic can also be used for self promotion, say for an upcoming indie band sending a well designed album package to an A&R person, a concert promoter or a music journalist/blogger to stand out from clutter of CD comps and digital download codes. The second opportunity is to rethink how music is being delivered in the digital age and how to enhance that experience. Music today is delivered though a series of digital interfaces that do not need album art to function at all. They are technically proficient, yes, but in that digital delivery we’ve lost the visual component of the music listening experience – like how I used to sit in my room listening to an album, looking though the liner notes and letting the artwork influence and color my perception of the music. That is an interesting question: how can we bring back the visual/album art component of listening to music on a digital platform? What types of artists/record labels are still likely to fork over some cash for designer album art? All artists need some sort of album art but it’s probably only the major labels or some of mid-size and larger indie labels who have budgets to pay a designers. Many labels have in-house design departments or the band may have a designer/artist they like to work with (or one the band members may be a designer themselves), so it can be tough to get your foot in the door as an independent designer. For this reason, it’s important to take on clients that allow you to pay your bills and make a living as a designer. If you have a good roster of paying clients it allows you to take on the “fun” projects on your own time, focusing on the opportunity and doing good work and less time stressing about making profit. As time goes on and you build up your portfolio and reputation in a certain industry, it may be possible to move more of your work into this area while being compensated for it. ← Sea Wolf in Communication Arts Illustration Annual!